Doctors fear the computerisation of medical records could threaten patient confidentiality. In future records will be stored on a national database, which will allow staff to access information wherever someone is treated. 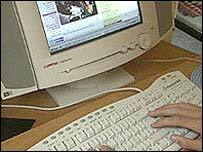 However, doctors are concerned the system, part of the NHS's £6.2bn IT upgrade, could be open to abuse. The issue was debated at the British Medical Association conference in Manchester. A survey released by the BMA on Thursday shows members of the public recognise the potential value of the new system - but many are seriously concerned about its security. Dr Richard Vautrey, a GP from Leeds and lead for IT on the BMA's GP committee, said: "Doctors have a fundamental duty to protect the confidentiality of the information that patients tell them. "And many doctors remained concerned that we seem to be sleepwalking into a system where a significant amount of personal and medical information is held on a national database without either us or patients fully understanding the long-term implications." Dr Vautrey said there was an urgent need for a public debate about the changes, both about the amount of information that is held on the system, and how patients could opt out without compromising access to healthcare. He acknowledged the system had securities built in. But he added: "An IT system is only as secure as its weakest link. "There are access controls so that doctors or other health professionals can only access what information is relevant. "For example, if a consultant is treating someone for a stomach complaint there is probably no need for them to know the person has had an abortion. "But our fears are that people will share their access controls, or others will hack into the system for commercial gain." However, Dr Vautrey said there were many benefits to the upgrade, which will link GPs and hospitals, transforming the way the NHS works. As well as the electronic records, the system will allow patients to book hospital appointments online at GP surgeries and create an electronic prescription system. He added he would like to see the information held on the electronic records system restricted to only the most critical data. Speaking in the debate, GP John Canning said: "The profession is held together by core values and one of these is confidentiality and we are in danger of removing that." But Dr Grant Kelly, a member of the BMA's council and GP, warned: "If we are seen to be restricting the sharing of data we have a problem." Dr Simon Eccles, an A&E doctor working with the Department of Health on implementing the new system, said security had been taken extremely seriously. "The security measures that have been put in place are greater than those in the banking industry." Dr Eccles said every time anybody looked at a record it would be logged. "I couldn't look up your blood test just on a whim. There are access controls that ensure I have a relationship with that patient. "That is much more secure than the present system using paper."